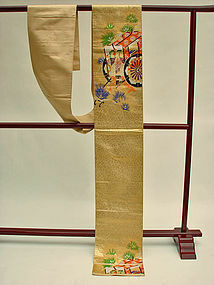 Silk textiles, particularly when they are woven with gold, can look very different in depending on the environment. For example, an obi used as a table runner can look very different when you see it from different side of the table. Exposing it to a full light can give a washed-out look. The weave of the design area in this obi is quite intricate. Extra photos are available at item #1092131. Please enter the numbers the search box (located on top right corner in our catalogue page).